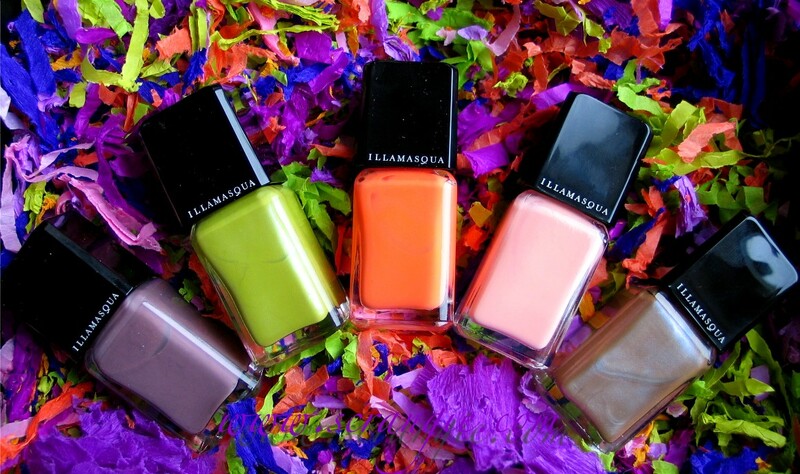 I think Illamasqua and other nail polish companies have very different ideas about creative inspiration. You know what I'm talking about, right? The other brands talk about their inspiration, "Oh, I went to the beach." or... "I took a road trip." or even worse, "I saw a celebrity." But Illamasqua doesn't just get inspired, they make their inspiration. They take an idea and build an entire world around it. They even give it a backstory! And that's what always makes me so excited to see what they're going to do next. Bacterium. Doesn't this color make you a little uncomfortable? The name, the murky, stagnant, dirty look of it? This is a mousy taupe/light brown/warm grey base with some frosty duochrome greenish shimmer. It has a little bit of a yellow undertone to it. It's like a decomposing version of Zoya Pasha. Gamma. Awesome, eye-burning neon orange. Since it's neon, it dries matte. You can wear it matte if you'd like, or add topcoat to make it glossy. Either way it will look loud! Purity. A clean, sweet and natural shade that contrasts with the bizarre, mutated, toxic and dangerous colors in the collection. This is a soft creamy pale peach. For comparison, it's more warm and pale than MAC Seasonal Peach and not as pink as Essie Van d'Go. Stagnate. Good name to go with this color. It's a murky purple-grey-brown creme. What was that word they use for this now? It's like "greige" but with purple... Grurple? I forget. As much as I do love these types of colors, I must say, it's so common now, there are so many of them, that it does look a little stagnant to me. Radium. A bright yet dirty radioactive pea green. What makes this special is the blue-green subtle shimmer that lights up when the light hits it. You can't see as much of the blue shimmer indoors, but it looks great in sunlight. The formula on these was different. It wasn't the same consistent, creamy, dense one-coat-opaque formula I'm used to from Illamasqua. Each color seemed to have a completely different texture. Stagnate was thin almost a little sheer, Gamma was thick and jelly-like, Radium was almost like normal Illamasqua formula, Purity was sticky feeling and Bacterium was a little runny. Despite the mixed bag of formulas, both wear time and dry time were excellent. Every shade except the neon Gamma dried very shiny even without topcoat. I was able to get nearly a week of wear out of Radium without chipping or tipwear. I love the theme and artistry of this collection. I love how they intertwine beauty and poison, danger and glamour... Nature fighting back... Seriously, doesn't it make you a little uneasy but excited at the same time? I love them all! Thanks for posting! Great swatches, I love Purity and Bacterium. Some of the names are a little off putting though! This is the first swatch of Bacterium where I've actually liked the colour. I loooove Gamma and Purity! Gamma really stands out, it's crazy! Not really into Bacterium, though. It makes me shiver. I have Purity and Bacterium. I love them. Bacterium went on easy as anything. Purity really isn't too much of a PITA. I've seen so many swatches of these and have just stayed silent, you know, as my mom always told me, "if you don't have anything nice to say, don't say anything at all." So now that I have seen them on the undisputed QUEEN of nail blogging, I'll put my opinion out there. Your swatches are gorgeous as always but I just cannot like these colors. The only one I'm okay about is Purity... the rest, EWWWW. I've thought Bacterium was gross from the start and I won't go into the others. *Whew* That feels better! This is a cool collection, but I REALLY do not like Bacterium. The color, to me, is ugly and the name makes the hair on the back of my neck stand up haha. I don't think I would ever name a beauty product Bacterium. "It's like a decomposing version of Zoya Pasha" *snort* That description cracked me up. I love it. I really like Radium, but the other colors are kind of... eh. Not bad, not great. Look like a lot of other colors that have come out lately. Too bad. I love these colors! maybe not the names but I def love all the colors. Great swatches! LOL "i saw a celebrity" cracked me up :D I love the concept of the collection but not the colours. I have Gamma and Radium and I love them! Gamma is gorgeous on the toes. Adorei todas essas cores! A Stagnate é a mais linda de todas. Excellent review! I agree with you as always and think the concept is cool. I probably have dupes for these and Illamasqua is not easy to get here, so I will pass. Thanks for swatching these! Agh, I fell for Purity. I can almost never resist a peach. Stagnate is pretty too, and Bacterium definitely looks cool. I like the collection but not enough to buy it. que cores maravilhosasssssssssssss!!!!! lindas mesmo... Será que tem no BRASIL??? I don't like them, not even one captured my attention. Great review! Sadly, the only one I like is Stagnate, and it seems very similar to Channelesque / Below Deck, which I already own. Kudos on making "ugly" polishes look great! I love Radium - it's chartreuse! The color is similar to OPI's 'who the shrek are you', but WTSAR doesn't have the beautiful blue shimmer that Radium has, and WTSAR also is a bit thin/watery in application. love the peachy color!!! so cute, romantic and springish!!! Oh wow! These shades are so vibrant!